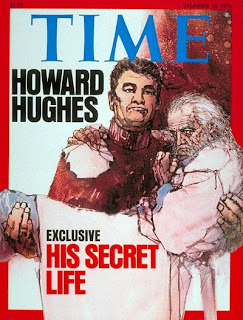 1976: Shortly After His Death, Time Magazine Exposes The Weirdness of Howard Hughes. Perched atop the service elevator in Acapulco's pyramidal Princess Hotel, Repairman Lidio Sandoval was performing a routine maintenance check one morning last week, when suddenly the car began to rise. To his surprise, it ascended all the way to the forbidden 20th-floor penthouse, which elevators could reach only if summoned by a special key. Peering unseen through an open panel in the ceiling, he watched in fascination as a drama unfolded in the car below. Anxious aides and a doctor wheeled in a stretcher bearing an old, apparently unconscious man covered only by a yellow sheet. A tube dangling from one of his arms connected him, presumably, to a dialysis machine. When the elevator reached ground level, the attendants brusquely shooed away curious hotel workers and loaded the man into an ambulance that sped to the airport. There the patient was placed in a waiting Gates Learjet ambulance plane from Miami. Before landing in Acapulco earlier that day, it had fetched from the Bahamas a vacationing Utah physician, Wilbur Thain, who was one of the patient's three private doctors. Pilot Roger Sutton was alarmed by the ailing passenger's condition. "He looked very emaciated, a pasty color," he recalls. "When they put him on the plane, he moved his lips, but I could not hear anything." As the Learjet streaked toward Houston, Sutton inquired about the patient's condition. "He is very close to dying," replied the doctor. After the plane touched down at Houston Intercontinental Airport, Thain told the pilot, "There is no hurry. He's gone." At 70, the legendary, invisible, mysterious, outrageous Howard Robard Hughes was dead. No American had ever intrigued and confounded his fellow citizens as did the once handsome and dashing Hughes. Squeezing several implausible careers into one lifetime, he was the fabled billionaire who squired and sometimes seduced the world's most beautiful women, the provocative moviemaker, the daring pilot, the unchallenged and capricious captain of an industrial empire and a huge airline, the innovative weaponmaker on whom the nation's defense rested in part. Yet despite his wealth and onetime glamour, he had turned into a recluse whose obsession for privacy only intensified the curiosity about him. For the past ten years his isolation had been so complete that only his death gave proof he had still been alive. He was the world's ultimate enigma—a man so secretive, so hidden from view that no outsider could say with certainty even whether he was alive, much less how he looked or behaved. He was one of the world's richest, most imperious, capricious, outrageous, eccentric and powerful men. From his hideaways atop a series of luxury hotels on three continents he spun a web that ensnared an entire state, reached into the highest levels of the U.S. Government and became entwined with the tentacles of the Central Intelligence Agency. Yet for all his power, he lived a sunless, joyless, half-lunatic life in those same hideaways, a virtual prisoner walled in by his own crippling fears and weaknesses. Once a dashing, vibrant figure, he neglected his appearance and health during his last 15 years until he became a pathetic wraith. 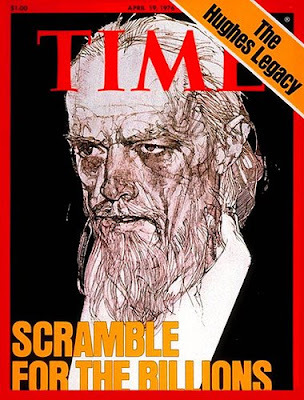 Another major layer is being peeled away in this issue of TIME, in the excerpts from a forthcoming book that contains many startling, fresh glimpses into Hughes' life. Titled Howard Hughes: The Hidden Years, it will be published next month by Random House, and was written by James Phelan, 67, a crusty investigative reporter who has been covering the elusive billionaire for more than 20 years. Phelan managed to interview the only close associates from Hughes' latter years who so far have been willing to talk. Excerpts from their often chilling testimony follow. # Posted at 10:13 AM. It was good at least for half of it. When it began talking about inheritance is where I lost interest. I liked the lines that talked about how extraordinary he was, including the 72-hour sit on a toilet. Yib shmab tidda blil flag! as a young kid I got to see 7000 romaine while waiting in the car as a doctor and Bill Kennedy aka Mr. LA. visited. Now here’s the funny thing early 80s I see him near Huntsville AL buying lawnmower engines as a very old man with bad hair plugs in tow was an extremely good looking well aged gal friend; she waited in a truck. This led to plenty of speculation against the Time magazine, and why wouldn't there be? The http://top-essay-writing.services/ mentioned how people really liked his personality. Damaging it wasn't a nice decision. it was a wonderful chance to visit this kind of site and I am happy to know. thank you so much for giving agen poker online terpercaya us a chance to have this opportunity..
it was a wonderful chance to visit this kind of site and I am happy. thank you so much for giving situs poker online terpercaya us a chance to have this opportunity..